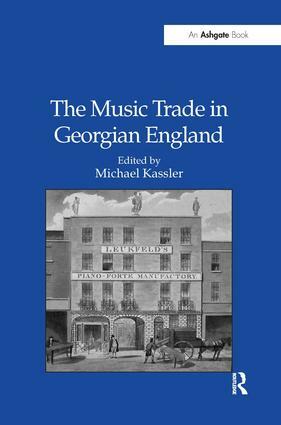 In contrast to today's music industry, whose principal products are recorded songs sold to customers round the world, the music trade in Georgian England was based upon London firms that published and sold printed music and manufactured and sold instruments on which this music could be played. The destruction of business records and other primary sources has hampered investigation of this trade, but recent research into legal proceedings, apprenticeship registers, surviving correspondence and other archived documentation has enabled aspects of its workings to be reconstructed. The first part of the book deals with Longman & Broderip, arguably the foremost English music seller in the late eighteenth century, and the firm's two successors - Broderip & Wilkinson and Muzio Clementi's variously styled partnerships - who carried on after Longman & Broderip's assets were divided in 1798. The next part shows how a rival music seller, John Bland, and his successors, used textual and thematic catalogues to advertise their publications. This is followed by a comprehensive review of the development of musical copyright in this period, a report of efforts by a leading inventor, Charles 3rd Earl Stanhope, to transform the ways in which music was printed and recorded, and a study of Georg Jacob Vollweiler's endeavour to introduce music lithography into England. The book should appeal not only to music historians but also to readers interested in English business history, publishing history and legal history between 1714 and 1830. 'The depth of knowledge displayed by the contributors to this book is deeply impressive and the reader comes away with a comprehensive understanding of the mechanisms of music production, sale and reproduction in Georgian England… Mr Kassler is to be congratulated on the production of such a rigorous and readable work… It's the best book on music in Georgian London I've encountered… this work deserves a wide audience amongst historians and musicians alike.' www.georgianlondon.com. Contents: Preface; Part I Longman, Broderip and Their Successors: Chronology of the business begun by James Longman; Longman and Broderip, Jenny Nex; Broderip and Wilkinson, Michael Kassler; Clementi's music business, David Rowland; Clementi as publisher, David Rowland. Part II Music Sellers' Catalogues: A Case Study: The periodical music collections of John Bland and his successors, Yu Lee An. Part III The Legal Context: The development of musical copyright, John Small. Part IV New Technologies: Earl Stanhope's 'letter-music', Michael Kassler; Stanhope's novel musical instruments, Michael Kassler; Vollweiler's introduction of music lithography to England, Michael Kassler; Summary of legal cases; Index of persons. Michael Kassler is an Australian musicologist. His works include Samuel Wesley (1766-1837): A Source Book (written with Philip Olleson), Charles Edward Horn's Memoirs of his Father and Himself, Music Entries at Stationers' Hall, 1710-1818, The English Bach Awakening: Knowledge of J. S. Bach and his Music in England 1750-1830, and A. F. C. Kollmann's Quarterly Musical Register (1812): An Annotated Edition with an Introduction to his Life and Works, all published by Ashgate. Yu Lee An is Librarian in Scholarly Information, University of Technology, Sydney. Her recent Ph.D. dissertation was on Music Publishing in London from 1780 to 1837 as reflected in Music Publishers' Catalogues of Music for Sale. Jenny Nex is Curator of Musical Instruments, Royal College of Music. She has published widely on musical instrument makers in Georgian England based upon archival research of their activities. David Rowland is Professor of Music and Dean of Arts at the Open University and Director of Music at Christ's College, Cambridge. His books include A History of Pianoforte Pedalling, The Cambridge Companion to the Piano, Early Keyboard Instruments: A Practical Guide and The Correspondence of Muzio Clementi. John Small is a private researcher based in Sydney. He has worked for the National Library of Australia and as an information technology manager for the Australian Broadcasting Authority.